Imagine: You're a 15 year old with a Spectrum. It's summer in 1989. It's raining outside and there's nothing on the 4 channels the UK had to offer. You've just purchased a new game for the computer, it's a budget title priced at £1.99, but you don't care. Some of the best games were budget games anyway. The box art promised an adventure similar to childhood movies like Beast master or Conan the Barbarian - which I was probably too young to watch, but watched them anyway. The tape was placed into the tape player and 3 minutes later the game had loaded to an amazingly atmospheric David Whittaker tune. So far, so good. I'm gonna slay me some orc men! The player was placed in a forest without any guidance, clues or any story as to how he became to be there in the first place. The forest drawn in a monochrome red with green leaves, mostly bare branches selling the feeling of death and dread - this was not a safe place to be. The player is attacked early on by skeletons and orcs which are fairly quickly dispatched with your sword or power. You are faced with a choice. Should you move to the left, you are faced with a tower with a bird-like creature waiting in a window. If you move in more, he swoops down and attacks you forcing you to either retreat or to fall into a pit of spikes. There is no way out of this pit, should you survive the fall you cannot climb out again, your only option is suicide by jumping onto the spikes. Move to the right and you see a hole in the ground and more monsters. They are quickly killed. Holes in the ground are never good so deftly leaping over the hole and moving to the right seems the most sensible course of action. To the right is another building with another bird creature blocking your path. Down the hole it is then. You fall down the hole and land in a dungeon room with ghosts floating around. They cannot be attacked. If they touch you, they'll hurt you, damage being shown by the state of four skulls on the bottom right of the screen - alas it seems these do not represent lives; however as you fall you notice something remarkable about how this game is displayed. Unlike other flip screen games of the era, Death Stalker doesn't show you anything you can't see from your current vantage point. So in order to see what's around the corner, you have to venture forth. This works really well where there are doors, pits and ladders. You can see the ladders, but you can't see what's on the platform above you. You'll have to climb them and see for yourself. The idea behind this was brilliant and added greatly to the atmosphere. It is also to my knowledge, the only spectrum game that did this. The presentation of the game visually was pretty good overall, it's graphical style lending itself nicely to the fantasy adventure style. The combat animations left a lot to be desired and the overall feel for the controls was sluggish. This could mostly be forgiven. Jumping would prove to be quite a pain. Jumps would often need to be timed very accurately to progress - or perish in a pit of spikes. The game ran at a poor framerate for the most part, it would periodically slow down while a piece of scenery came into view or disappeared. I can understand this, it was doing a lot with the limited power of the spectrum. The speed problem was forgiven and there were certainly worse examples of performance. Killing creatures caused items to drop. Keys, food, potions and other goodies which would help in your quest. There was a primitive verb based inventory system. It was slow to use, but functional. There were also NPCs to talk to - prisoners to rescue. A nice touch making the dungeons feel alive and giving the player purpose. Even the ghosts would talk. Death Stalker's biggest problem though was that it had more than a fair amount of instant death traps and areas with no way to return, whose only end was a gruesome death. Spike pits aplenty and pits of acid. The game became a tedious memory game instead of the hacking slashing adventure it wanted so hard to be, which was a shame really. If you were lucky enough to make the correct choice, you'd better remember what you did and don't be curious about the other door or wonder what's just off the ledge, it'll be certain doom if you do.. or maybe not, there was no way to be sure. The dungeon appeared to take joy in killing or trapping the player without mercy. Only by knowing the correct path did you stand a chance. Then again, the game was called Death Stalker - what did I expect? Once your health had depleted, it was game over. You'd have to start all over again from the beginning. Back in the speccy days, this wasn't such a shock - but can you imagine what would happen if a game pulled that trick today? Current difficult games like Dark Souls had nothing on this. 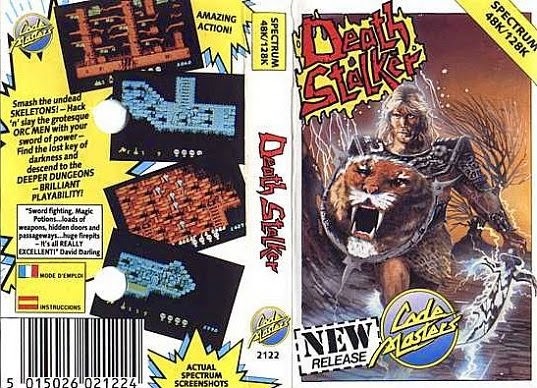 Death Stalker is a game which I wish was a bit better. It could have been a classic. Instead we have some good ideas and a nice soundtrack and a dungeon that wants to kill you, horribly. I really wish CodeMasters hadn't put the legal blocks on their games being reproduced or stored on-line. It means that games like this will disappear into obscurity. I believe that there's still something to learn from DeathStalker; After-all, I still remember it fondly. Remembered for being a little awkward and a cruelly difficult - but remembered all the same even after all these years. Tony Warriner now works as the co-founder of Revolution Software and he's made some games you have probably heard of: Lure of the Temptress, Beneath a Steel Sky and Broken Sword.